Anyway, A friend and I were at a gun show in Ft. Worth Texas (I am a Texan), and it was a very busy and great show. My buddy looked over a guy’s shoulder and, low and behold, there was a used one on the table. You can imagine my reaction after looking for 6-months. I squirmed my way in and put my hands on it. The woman helping the owner asked if she could help. I said, “I would like to see this Springfield.” She unhooked the warning system and I put it in my hands. I have owned several Colts and Springfields including a Trophy Match, which is an awesome gun, but this one felt good. I looked it over and it had slight holster wear and then checked functioning parts. All OK. I pulled slide back about 1/16 inch and barrel was still tight – so on and so forth. I ask the history of the gun and she said she had no idea and had just got it in the day before. The gun had been shot (looking at the inside of the barrel) but it was in great shape. The price was $550.00. Of course I asked for bottom $$$ and yep – that was bottom dollar. Looking on the net and talking to Springfield, that was not a bad price and you will understand more as you read. I purchased and was on my way. I took my new baby home and took the Green Monster apart and cleaned and inspected. By the way, I have cleaned everything I own with Kerosene and it always works great, but this time in the barrel, I used Outers non toxic foam twice, and barrel shined like new. I understand Gunslick makes same. Oiled, greased, buffed and out to the range. A little back ground: I shot IPSC and IDPA since 1987 but have had to quit for a health reasons, but I still always shoot as if I were doing that, with minor modifications. I put some standard IPSC targets up and some steel – and loaded it up – always one round at first with head turned, to insure it functions, especially with a used pistol. Most of my 45’s in the past have had adjustable sights but this one has standard Novak sights which are adjustable for windage only, and they are night sights. I put 3 rounds in and off to one side as fast as I could. Perfect. I put three more in and lined up on the black line I put across the target – leveled and centered my sights and round one – ½ inch below and off center, ½ inch at 10 yds. Second shot little above and third little left but I figured it was me. This was all with normal IPSC stance free hand. This was out of a Chip McCormick mag so I loaded three more in a Colt mag and stepped back five yards. Leveled and centered: first shot, almost dead on. I turned and fired at two steel and plink-plink down they went. WELL, you know that satisfied feeling and that high you get off of smelling a fired piece of brass? WOW. I loaded a CM 11-rd up and went to town – six steel and five shot group on paper – 4-A’s and B, then an aftermarket mag and at 20 yds. I lined up on the steel and first shot was off center 1-1/2 inch and low 1 inch. Took rest out and one on paper head shot – about right corner mouth (you have to imagine that on a IPSC target). So I loaded CM up and to do a test. Now I will remind you, none of this is bench rest stuff. Long time ago I shot Bullseye, so I got into stance with five rounds at 12 yds., and shot five rounds in about 15 seconds. HOLY COW – I covered all five shots with a fifty cent piece. I continued my shooting time with about 200 rounds standing, sitting, one knee, BLA, BLA – what a weapon. Not one single malfunction at all, in about hour and fifteen minutes. This is by far one of the best I’ve ever owned. It’s fully loaded, with ambi safeties and the works. It’s a heck of a pistol, and there is no other feeling like a single stack 1911 in your hands. 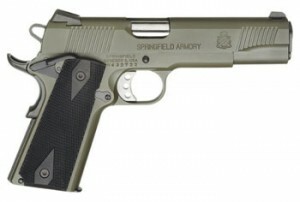 To be honest – like I said, I have owned many 1911/A1’s – Springfield is by far the best.